All of our item(s) our handmade and embellished right here in our shop, and each item(s) are one-of-a-kind and unique. We make Complete Layouts, Pre-Made Chipboard Albums, Deco Art & More! We keep an arrangement of gifts for all occasions on hand, including holidays, birthdays, travel, animals & more. If you don't see what you need here, we are happy to make special orders. Be sure to check out our Customized Banners for any occasion! Weddings, Birthdays, Showers, Baby's Room... Any Name, Word, Phrase Or Theme! Don't miss out and let us customize yours today for your next event! 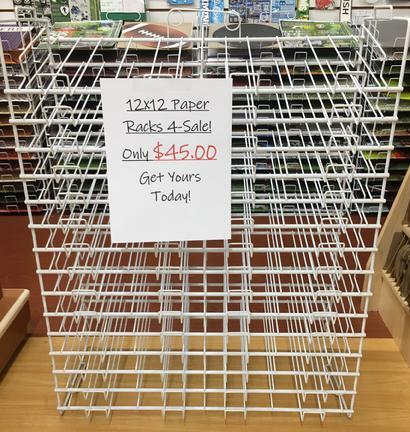 Paper Racks For Sale! Pick up only! Merry Christmas Banner! Perfect for your entryway, door, party area or near your Christmas Tree. Gorgeous Christmas wreath. All petals are double sided, beautiful thematic paper adorned with red and green tulle. Topped off with glistening white silk flowers and glitter. This will add holiday spirit to any door. Would make a great gift but we think you'll want to keep it for yourself! Merry Christmas Canvas art wall decor! Perfect way to display your favorite Xmas pictures and add holiday decor all at the same time! This canvas is 12 x 16 and have two photo mats for 5 x 3 1/2 photos. Its handcrafted with just the right amount of bling to add a little pop on your wall! Perfect as a Xmas gift or just another goodie to help you decorate for this Holiday season! This Trick Or Treat Premade 12x12 Double Layout is ready for you to add all your spooktacular photos. Layout has four slots for pictures and lots of details! Items also used on this page: Cardstock, Patterned Papers, Stickers, die-cuts, embellishments & more! Happy Halloween! This Halloween PRE-MADE Scrapbook Album 6 X 6 � 18 pages including front & back covers. This chipboard album was crafted with beautiful bright Halloween papers. Perfect album to put your Halloween pictures into or to use as a Halloween decoration! Check our Etsy page to see all inside of this ghoulish mini album! Halloween Layout. This Halloween Premade 12x12 Single Layout is ready for you to add your favorite photos and has lots of details! Items also used on this page: Cardstock, Patterned Papers, Stickers, die-cuts, embellishments & more! Boo Wreath! This Spooky Wreath is the perfect decor addition for anyone whether it on your front door or in the office! Handmade will Tulle & spooky eyes and more! This banner reads "Happy Halloween" and would be the perfect addition to your party or home decor this Halloween! Give Thanks Fall Banner is perfect for any home decor or office decor during fall season. Also great banner for Thanksgiving! This Halloween Altered Journal is perfect for any Halloween fan! This Composition notebook has been transformed into a Spooktacular altered Journal! Winter Wonderland Layout. This Winter Wonderland Premade 12x12 Double Layout is ready for you to add your favorite photos.Layout has three or four slots for pictures and lots of details! Items also used on this page: Cardstock, Patterned Papers, Stickers, Ribbon, die-cuts, embellishments & more! New Years Layout. This New Year's Eve Premade 12x12 Double Layout is ready for you to add your favorite photos.Layout has four slots for pictures and lots of details! Items also used on this page: Cardstock, Patterned Papers, Stickers, Ribbon, die-cuts, embellishments & more! April Showers Layout. This April Showers 12x12 Single Layout is ready for you to add your favorite photos. Layout has three slots for pictures and lots of details! Items also used on this page: Cardstock, Glitter, Ribbon, Die-Cuts, embellishments & more! Easter Banner. Perfect for your entryway, door, party area or near your Easter Decor. Great for Decorating in the Spring! Hoppy Easter! Disney Happy Birthday Banner. This banner is perfect for a Disney fan or Disney theme party. YOU CAN REQUEST any customization. This item is ready to ship! Customized banners will be shipped out asap too. Just Keep Swimming! This unique pre-made chipboard album is 6x6 with 10 beautifully decorated pages with patterned papers, lots of embellishments and pockets leaving you more room for your favorite photos and memorabilia. This chipboard album is a perfect for any Nemo Fan or to put all your Disney Memories inside. Make Your Own Banner! Customized Banners For Any Occasion! Weddings, Birthdays, Showers, Baby�s Room� Any Name, Word, Phrase or Theme! Don�t miss out and let us customize yours today for your next event! If you are interested in purchase, please contact our shop today! "Disney Brave" themed premade scrapbook border set! These adorable 12-inch premade scrapbook borders are already put together for you, designed for 12" x 12" pages but easily cut to fit smaller page sizes. These completely unique store salads are filled with tons of random useful scrapbooking supplies and papers! Each salad is filled to the brim with goodies and treats of the scrapbooking variety! No two salads are the same!There are no promises of what is included in each store salad, but we can guarantee that you will definitely find something you love inside the salad! This listing is for only one item but you can definitely order more than one just click a quantity when you are checking out! "Pretty Girl" themed premade scrapbook border set! These adorable 12-inch premade scrapbook borders are already put together for you, designed for 12" x 12" pages but easily cut to fit smaller page sizes. This Precious Baby Boy 12x12 double layout is ready for you to add your favorite photos. Layout has four slots for pictures and lots of details and is perfect for a Baby Shower or great gift idea! Darling custom-made and one-of-a-kind HELLO KITTY theme chipboard photo album spells FRIENDS. Great gift or for that special someone that loves HELLO KITTY. Back 2 School Altered Chipboard Word Album.This chipboard album spells out the word School and is the perfect album to keep all your kids school pictures. Ballet Layout.This adorable Ballet 12x12 double layout is ready for you to add your favorite photos. Baseball Layout. This Baseball Premade 12x12 Double Layout is ready for you to add your favorite photos.Layout has fourteen slots for pictures and lots of details and hidden flips to add even more of your favorite baseball pics! Items also used on this page: Cardstock, Patterned Papers, Stickers, die-cuts, embellishments & more! ROARRRR! This Dino-Mite double 12x12 layout is ready for you to add your favorite photos. Layout has six slots for pictures and lots of details! Be My Premade Layout. This Be My Valentine 12x12 Double Layout is ready for you to add your favorite photos. Layout has seven slots for pictures and lots of handmade details! Items also used on this page: Card Stock, Patterned Papers, Stickers, Handmade Die-Cuts, embellishments & more! Great for Valentines Day & any of your love photos and all the hard work is already done for you! Giggles Premade Layout This Girly Giggles Premade 12x12 Double Layout is ready for you to add your favorite photos.Layout has three slots for pictures and lots of details! Items also used on this page: Cardstock, Patterned Papers, Stickers, die-cuts, embellishments & more! Heart Premade Layout. This Heart Premade 12x12 Double Layout is ready for you to add your favorite photos.Layout has four slots for pictures and lots of details! Items also used on this page: Cardstock, Patterned Papers, Stickers, Ribbon, die-cuts, embellishments & more! Simple Pleasures Premade Layout. This Simple Pleasures 12x12 Double Layout is ready for you to add your favorite photos.Layout has six to eight slots for pictures and lots of details! Items also used on this page: Cardstock, Patterned Papers, Stickers, Ribbon, die-cuts, embellishments & more! BBQ Premade Layout. This BBQ 12x12 Double Layout is ready for you to add your favorite photos. Layout has many slots for pictures and a mini pocket album to add more! Items also used on this page: Card Stock, Patterned Papers, Ribbon, Stickers, Handmade Die-Cuts, embellishments & more! Great for all your favorite summer time BBQ pictures and all the hard work is already done for you! Rock Star Layout. This Rockstar Premade 12x12 Double Layout is ready for you to add your favorite photos.Layout has two slots for pictures and lots of details! Items also used on this page: Cardstock, Patterned Papers, Stickers, die-cuts, embellishments & more! Dot Layout. This Adorable Dot Premade 12x12 Single Layout is ready for you to add your favorite photos.Layout has five slots for pictures and lots of details! Items also used on this page: Cardstock, Patterned Papers, Stickers, die-cuts, embellishments & more! Band Layout. This Band Premade 12x12 Double Layout is ready for you to add your favorite photos. Layout has three slots for pictures and lots of details! Items also used on this page: Cardstock, Patterned Papers, Stickers, die-cuts, embellishments & more! Margarita Layout. This Margarita Premade 12x12 Single Layout is ready for you to add your favorite photos.Layout has three slots for pictures and lots of details! Items also used on this page: Cardstock, Patterned Papers, Stickers, die-cuts, embellishments & more! A Pocketful Of Fun PRE-MADE Scrapbook Album 6 X10 � 6 pages including front & back covers. This canvas cover chipboard album was crafted with beautiful bright green and blue papers. Colorful ribbon bind this album together. It includes embellishments, stickers, rhinestones,ribbon, canvas,chalk ink, etc... . The only thing you have to do is add your pictures! This Girly Giggle unique pre-made paper album is 5X7 with 16 beautifully decorated pages with patterned papers, lots of embellishments and pockets leaving you more room for your favorite photos and memorabilia. Handmade 6x6 Summer Accordion Book. I have included pictures of one open so you can see how it unfolds. Perfect to display all your family summer vacation photos! Each album ties with ribbon so its a stylish table accent. This one of a kind Train Adventure pre-made mini album is 6 X 4 1/2 with 12 decorated pages with unique patterned papers, embellishments and lots of room for all your favorite train photos. This album is perfect for any train enthusiast,and also great for any Travel Town photos you have!